The Indiana State Teachers Association were meeting with state legislators to lobby them to amend a pending school-safety bill to prohibit active-shooter drill instructors from firing projectiles at teachers. The bill was inspired in part by the 2018 shooting at the Marjory Stoneman Douglas High School in Florida, during which a gunman killed 17 students. That shooting helped galvanize a movement to address an alarming new data point: Although school shootings remain relatively uncommon in the US, last year saw the largest spike in school shootings since Columbine, according to an analysis by the Washington Post. Active-shooter drills are becoming more common, but do they actually work? “Since Columbine, 32 states have passed laws requiring schools to conduct lockdown drills or some form of emergency drill to keep students safe from intruders. Some states went even further after 20 children died in Newtown, Connecticut, in 2012. Now, six states require specific “active shooter” drills each year. That means the training must be specifically tailored to respond to an armed gunman out to kill. There is no consensus on what these drills should look like, but several states, including Missouri, require shooting simulations with police officers. This new era of school-safety measures is having a sweeping impact on millions of children. The Washington Post did an exhaustive survey of the 2017-2018 school year and found that more than 4.1 million students experienced at least one lockdown drill — 220,000 of those were kindergarten or preschool-age students, the Post found. 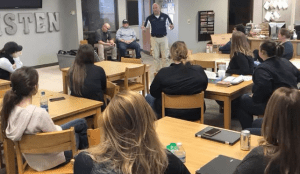 The disconnect between training and prevention has inspired a range of new approaches toward averting the next school shooting. As Indiana teachers argued this week, however, shooting teachers with rubber bullets shouldn’t be one of them.